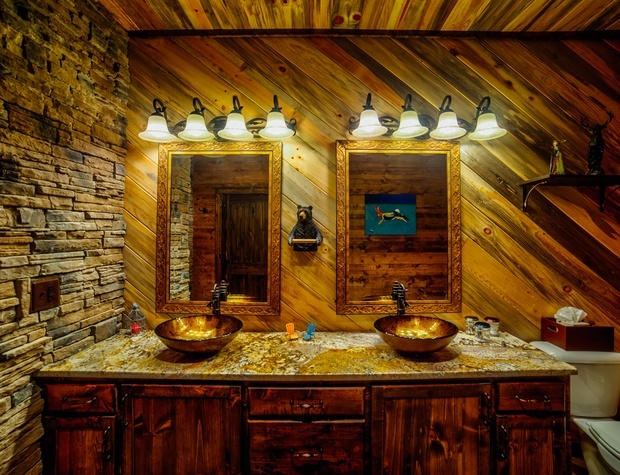 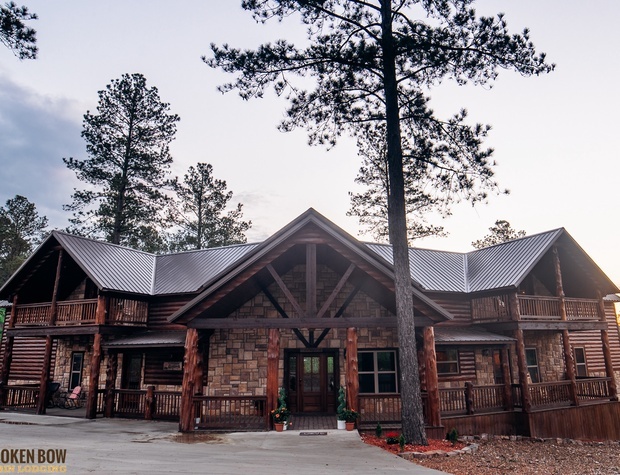 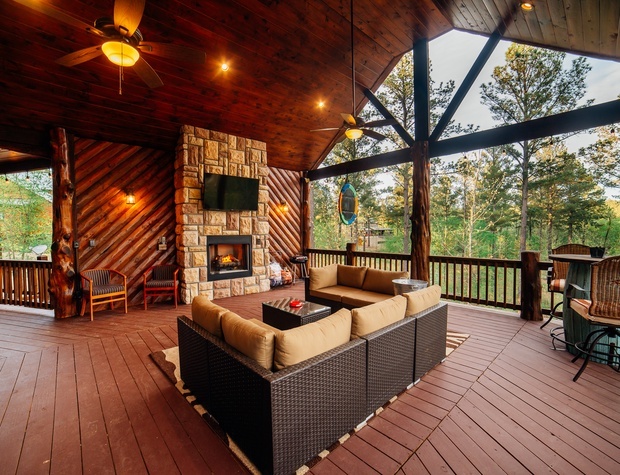 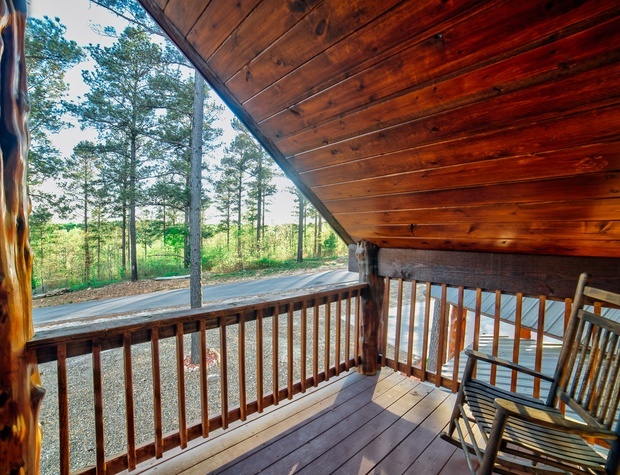 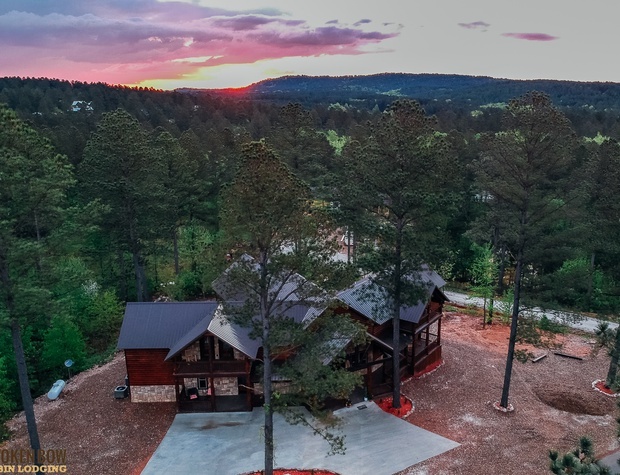 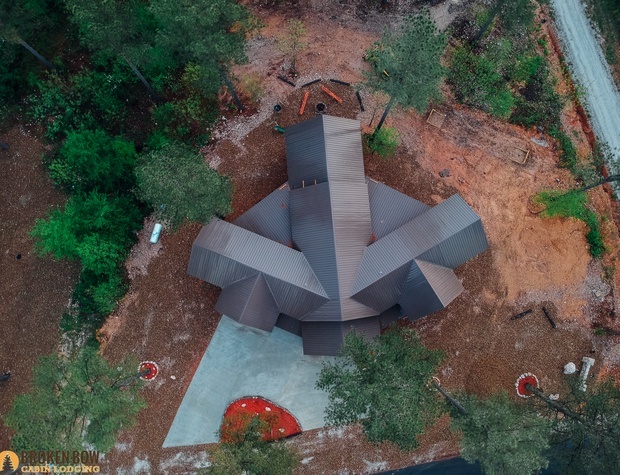 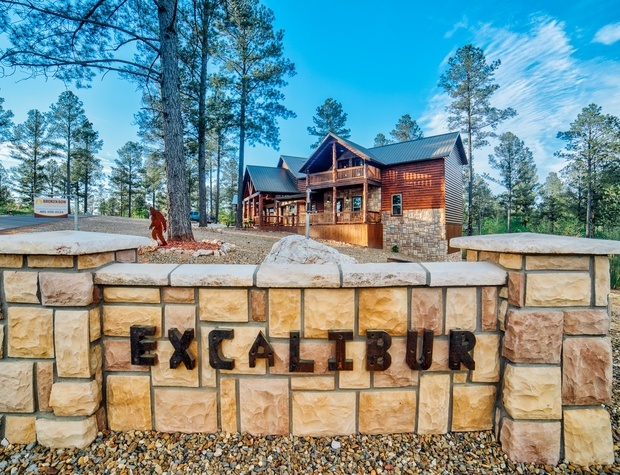 Excalibur is a BRAND NEW LUXURY CABIN in the stunning Eagle Mountain area of Hochatown!! 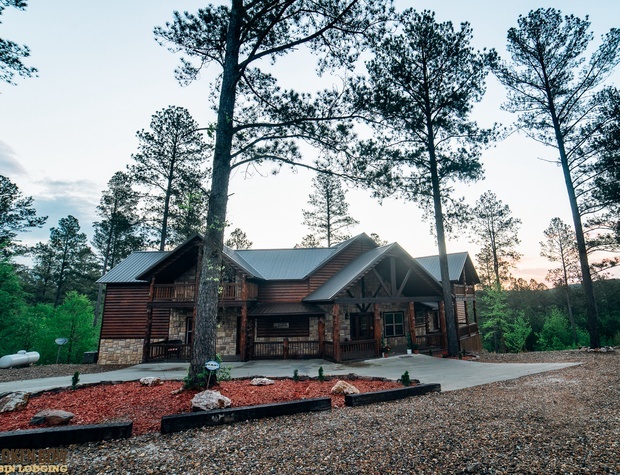 Located just minutes from all the fun and adventure Broken Bow Lake and Beavers Bend State park have to offer!! 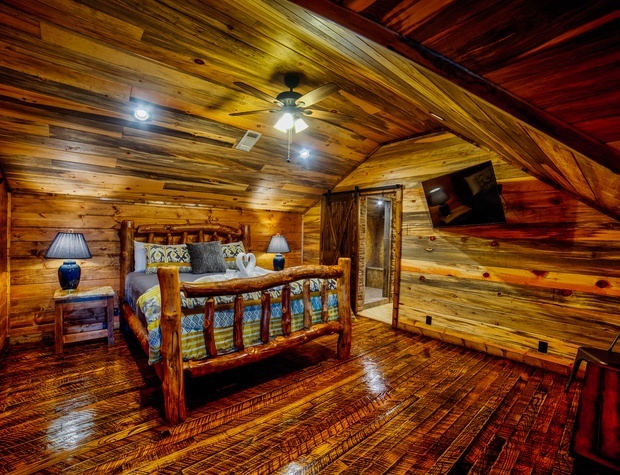 This gorgeous, one of a kind cabin is loaded with amenities and houses 6 King suites, two queens with full trundles, and 4 twins accommodating 28 guests!! 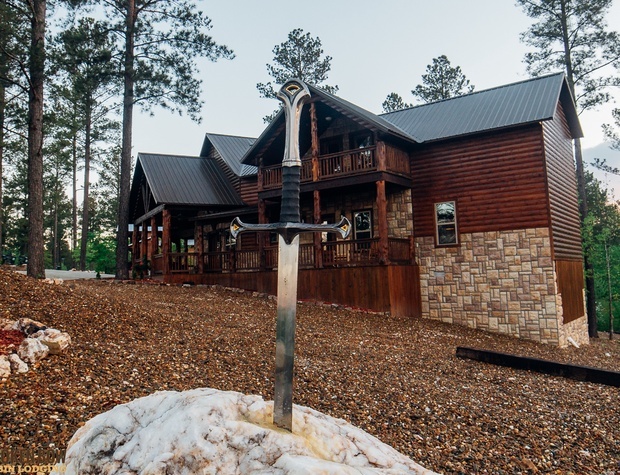 Excalibur is a truly unique cabin experience, with handicap accessibility. 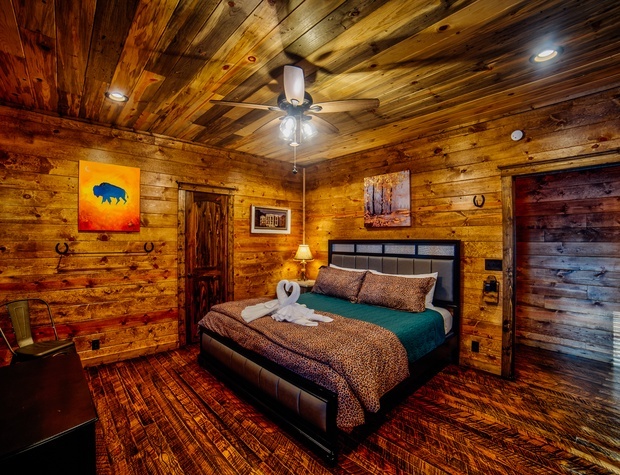 Bring the entire family for a truly memorable vacation! 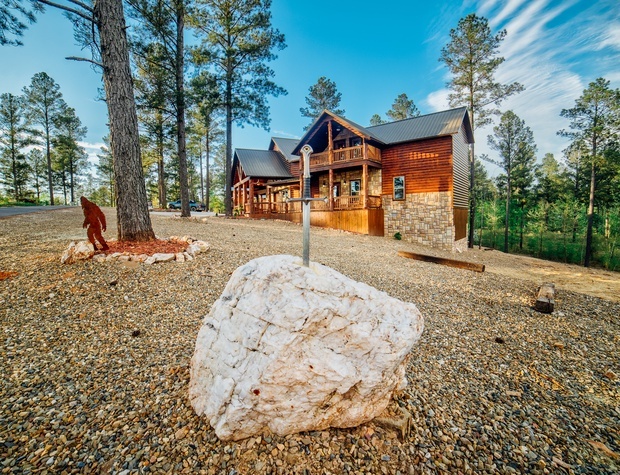 A massive concrete driveway allows for easy entry to this one of a kind, custom cabin. 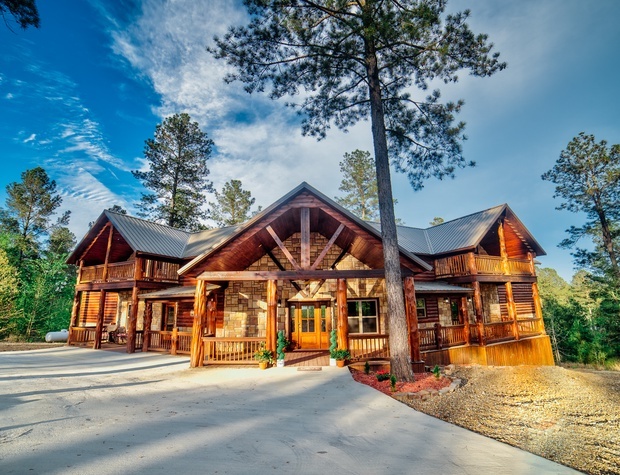 With two front entrances, the main entrance leads to the expansive, interior living space. 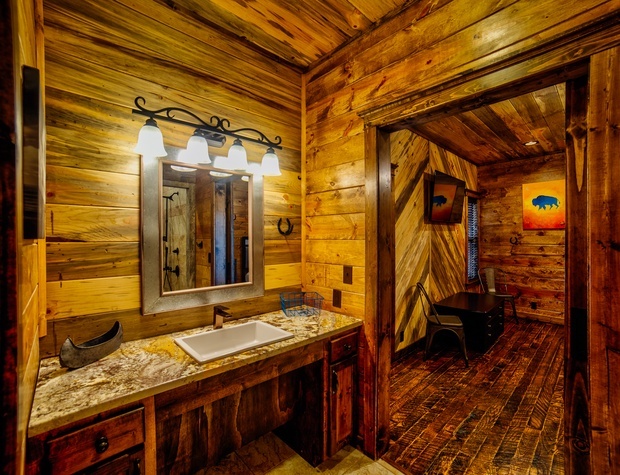 The secondary entrance with wheelchair access, leads directly to the suite designed specially for our handicap guests. 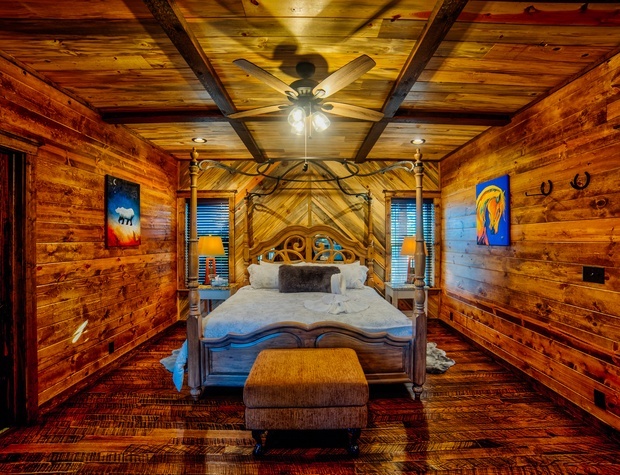 You’ll find a relaxing retreat just inside the giant wooden doors. 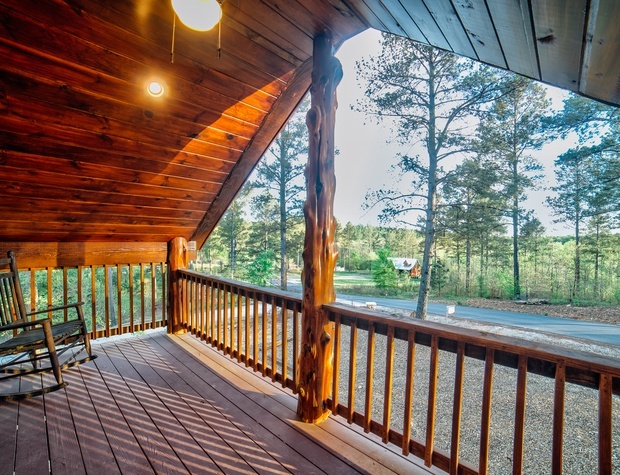 An open concept greets you as you step inside to the magnificently, crafted cabin. 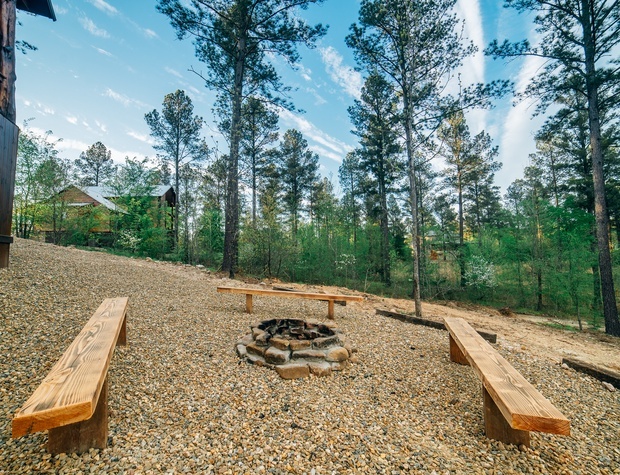 The massive stone island provides seating to chat with your guests as you prepare a delicious, gourmet meal from the fully equipped kitchen. 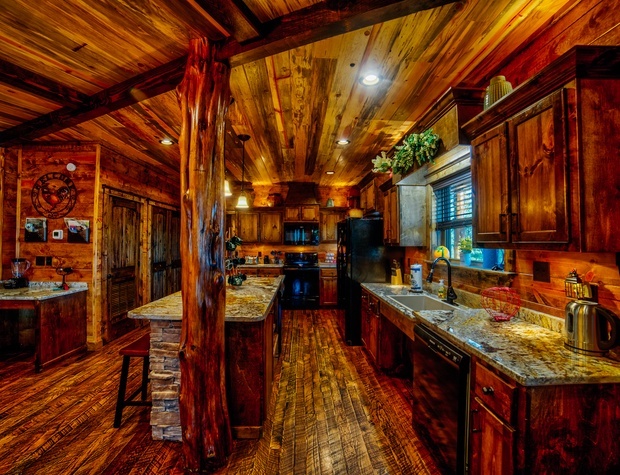 The granite counter tops, sleek, black appliances, including two cook tops, provide all the necessities you will need! 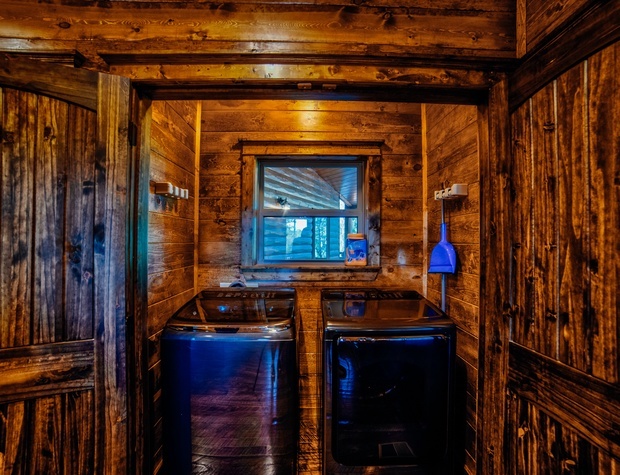 Also, 2 dishwashers make clean up easier than ever! 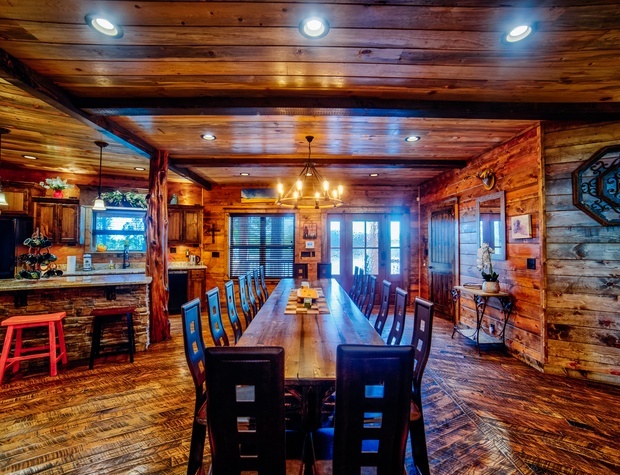 The large, farm style dining table provides seating for 16 people. 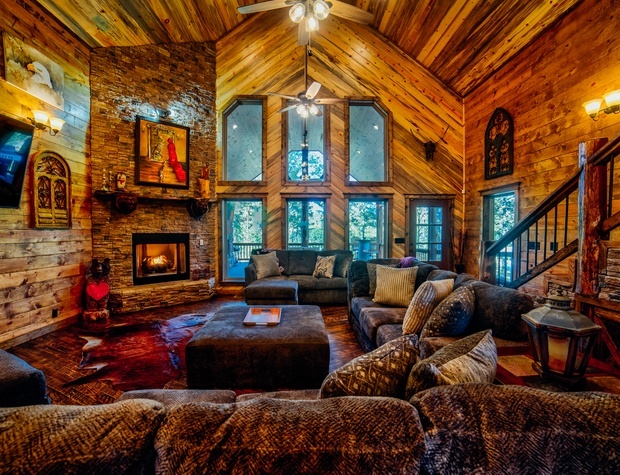 You’ll stay warm and cozy in front of the gorgeous, floor to ceiling, stacked stone fireplace. 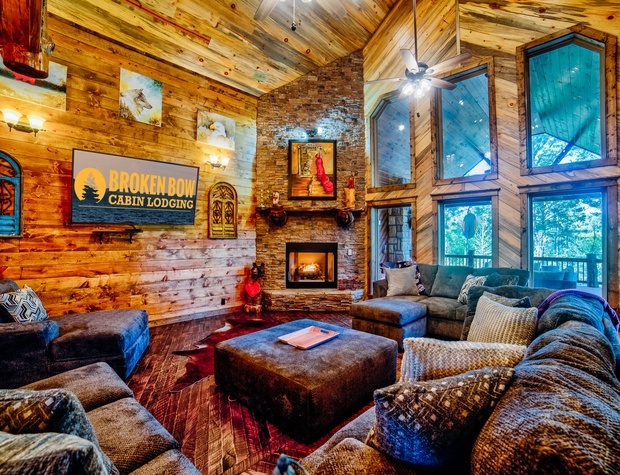 The mantle features intricately carved bear heads. 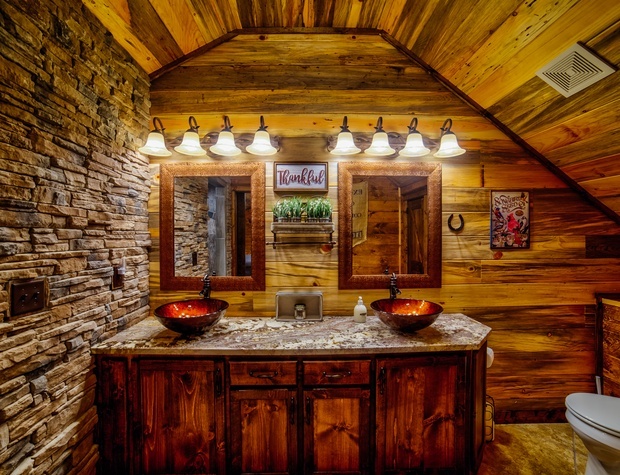 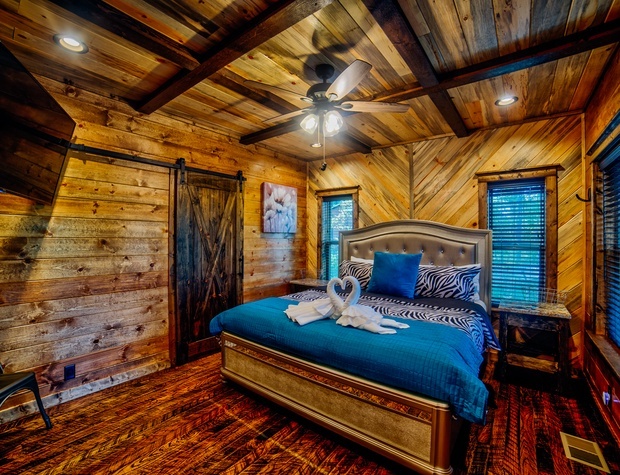 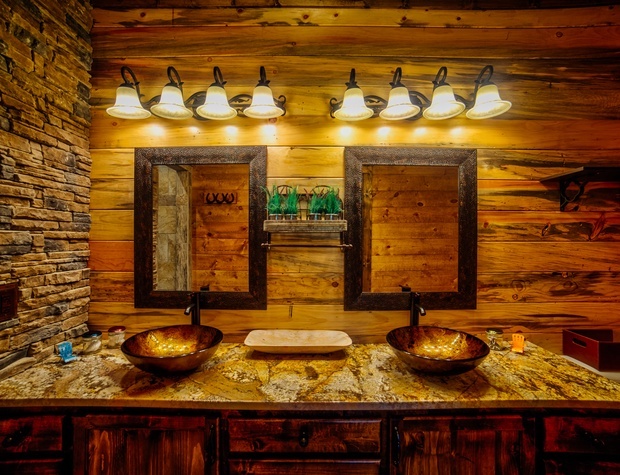 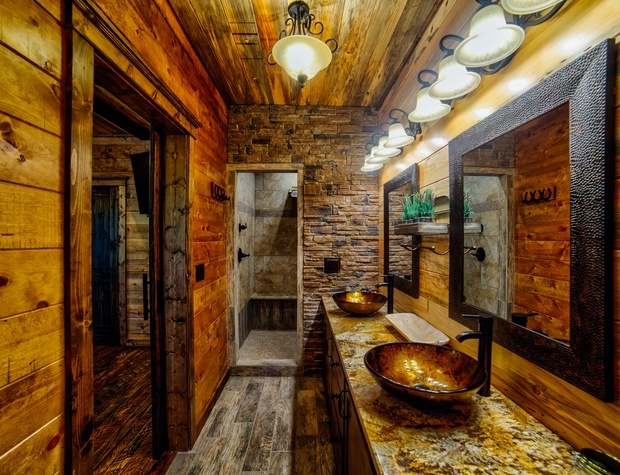 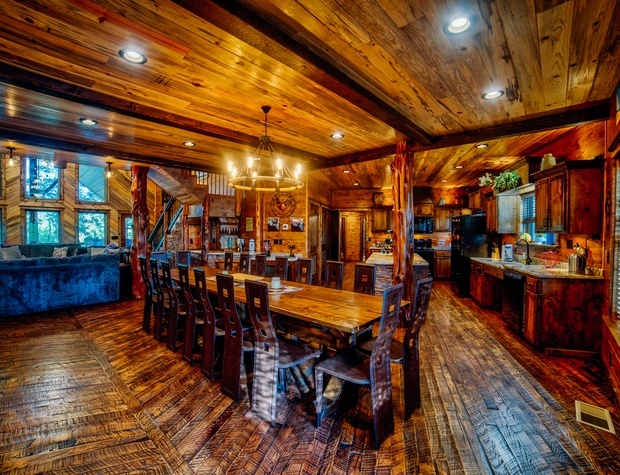 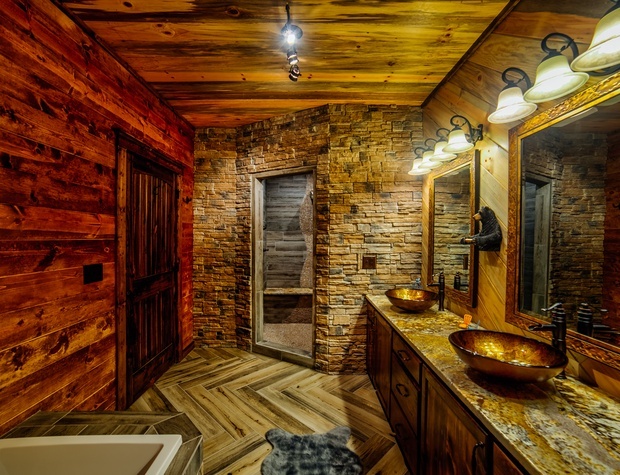 This luxurious, log cabin is fit for royalty, with it’s elegantly, rustic design! 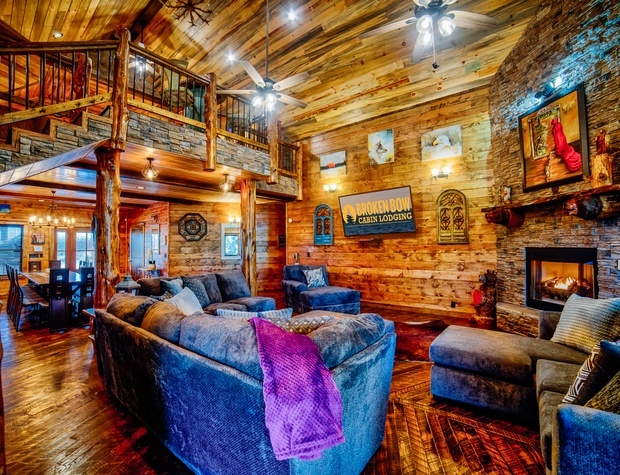 The main living space features over sized, comfy sofas in front of the massive HDTV with Direct TV package. 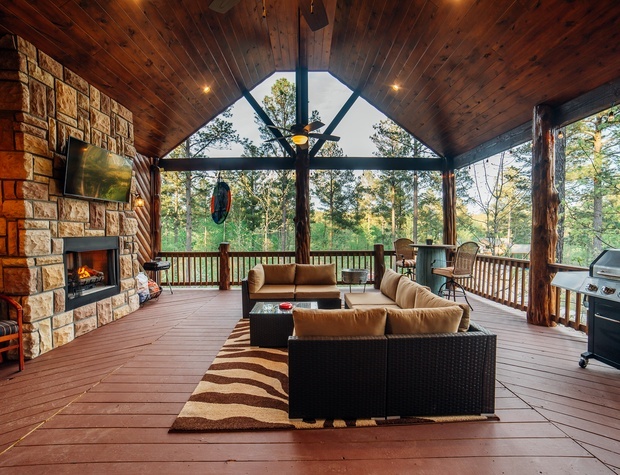 The large picture windows allow you take in the breath-taking beauty of your surroundings! 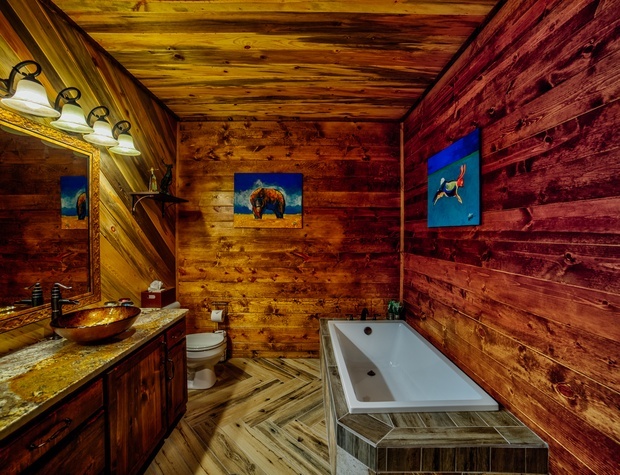 Off the kitchen there is a half bath and a laundry closet with full size washer/dryer. 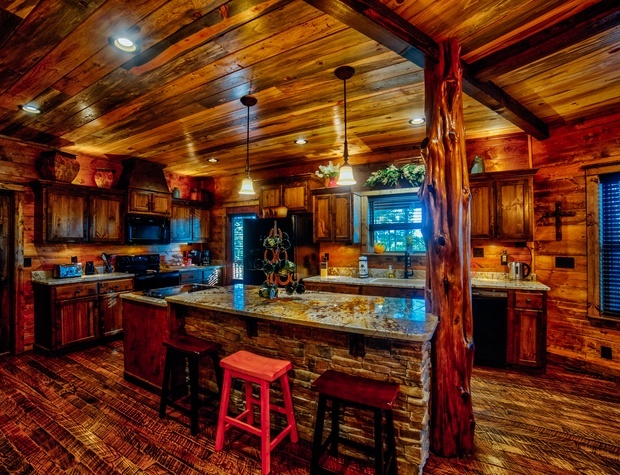 A stack rock accent wall adjacent to the kitchen area has a custom beverage/snack bar with wine chiller. 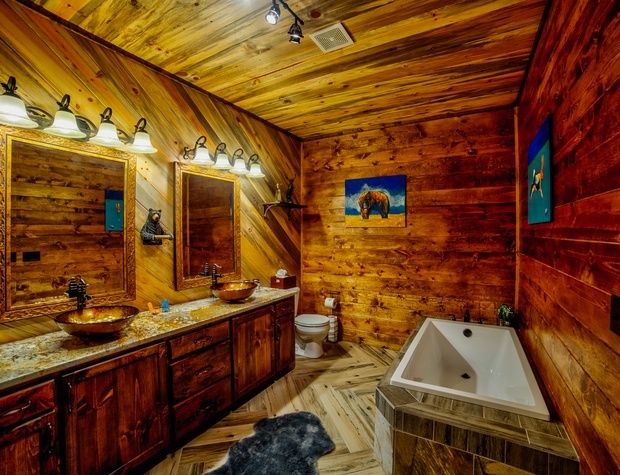 There is a writing desk for planning your days activities and a “Doggie Condo” hidden under the stairs. 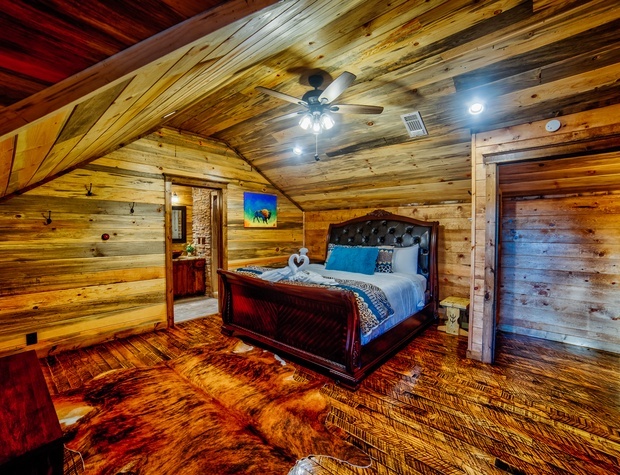 There are three bedrooms on the downstairs floor. 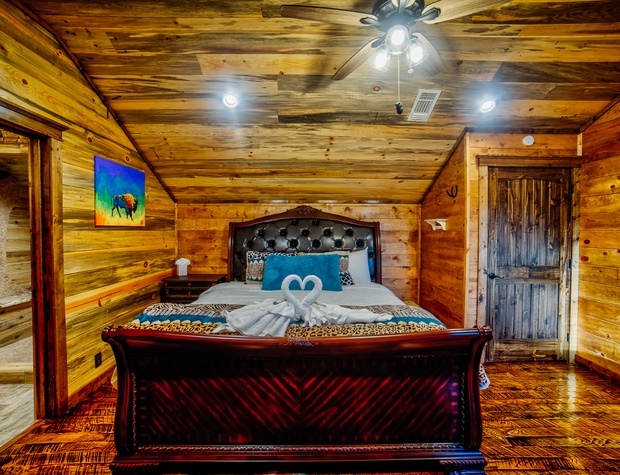 A master bedroom suite to the right of the kitchen has a king size four-post bed with luxury linens, a closet for holding personal belongings, a HDTV with Direct TV package (PPV not available). 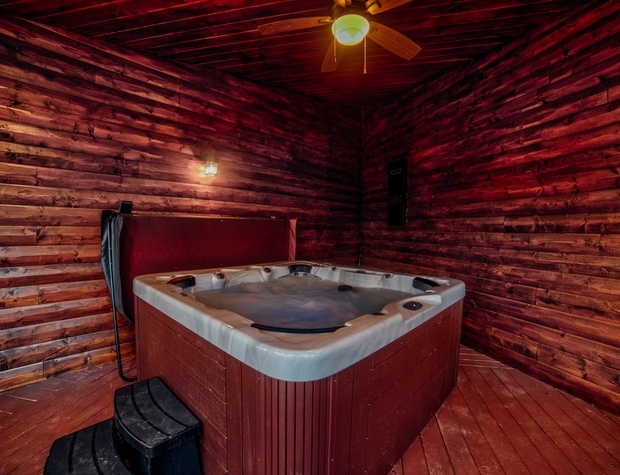 A door leads to the back deck area where one of the hot tubs awaits you to soak your cares away. 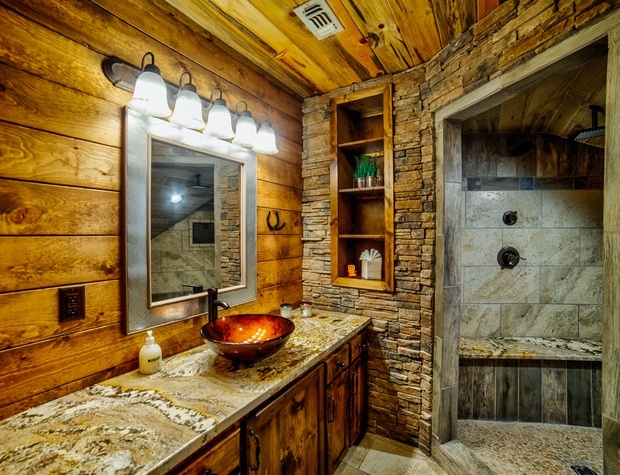 The attached bath has double vanity, and soaking tub. 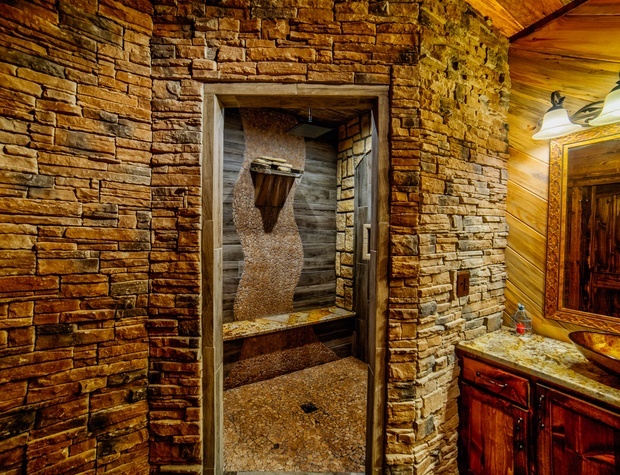 The custom stack rock shower has a built in granite bench, a flat-rock waterfall shower head, a rain shower head from above and a standard shower head. 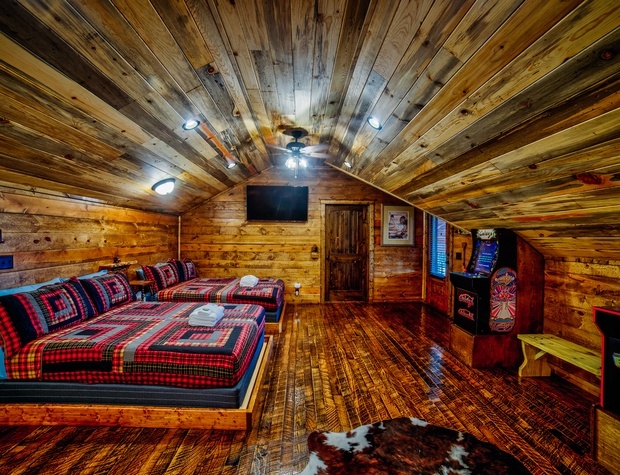 The second bedroom downstairs is to the left of the main living area. 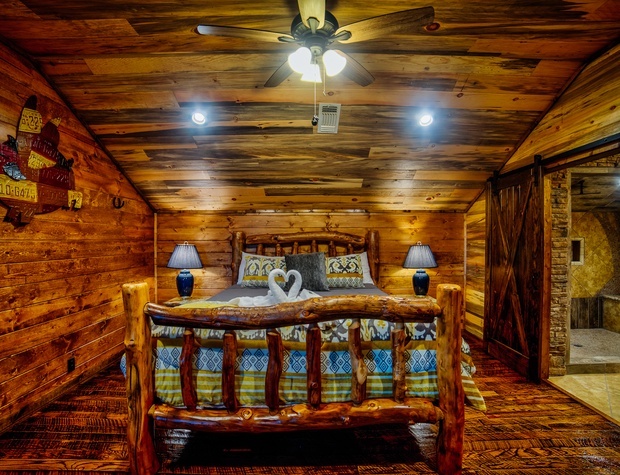 This bedroom has been customized to be handicap friendly with a low profile king size bed wrapped in luxury linens, and a door to the front entrance. 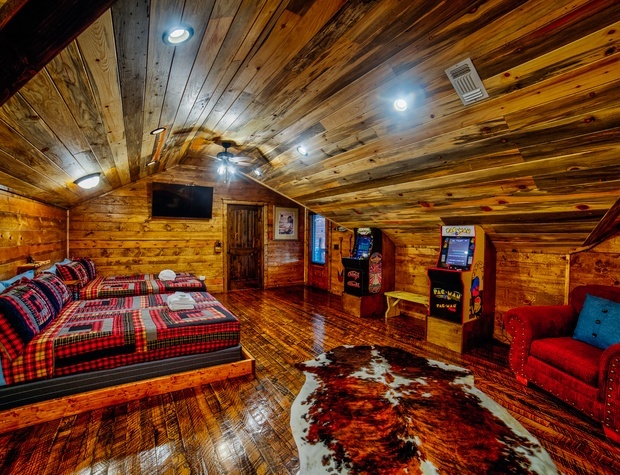 There is a HDTV with Direct TV package (PPV not available) mounted to the wall. 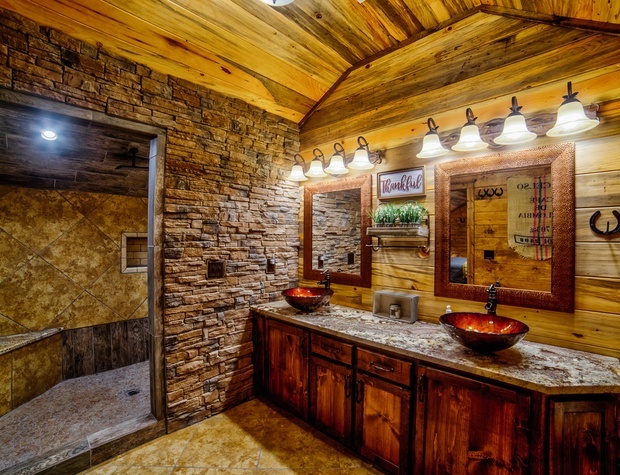 The attached bath has a roll up single vanity, a roll-in shower with multiple shower heads and is equipped with multiple grab bars. 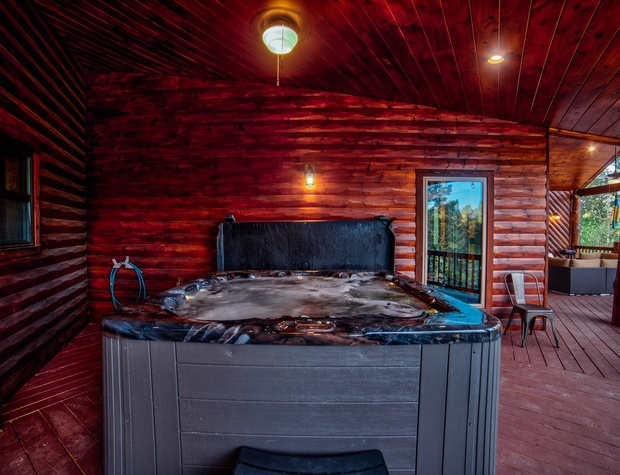 A third bedroom downstairs has a king size bed wrapped in luxury linens, a HDTV with Direct TV package (PPV not available) and a door to the back deck area where the second hot tub awaits you. 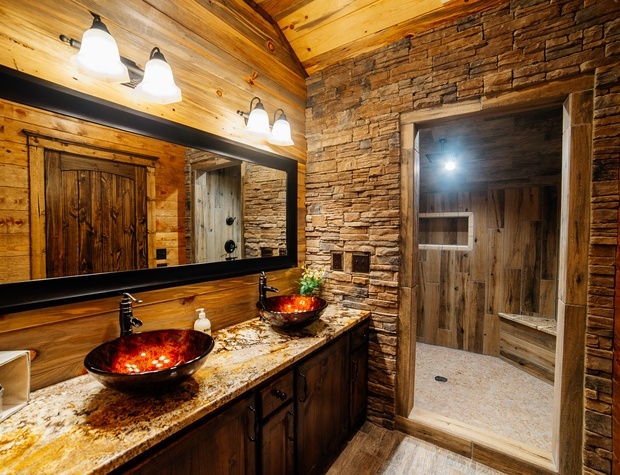 The attached bath has double basin vanity and a custom stack rock shower with built in granite bench, a flat-rock waterfall shower head, a rain head from above and a standard shower head. 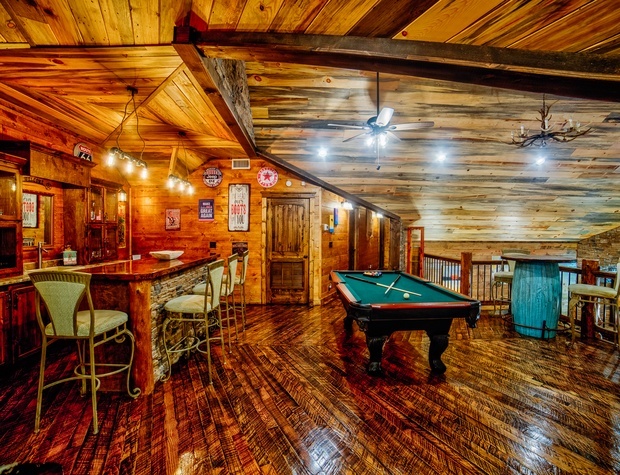 Go up the stairs located in the main living space to the Tavern/game room area. 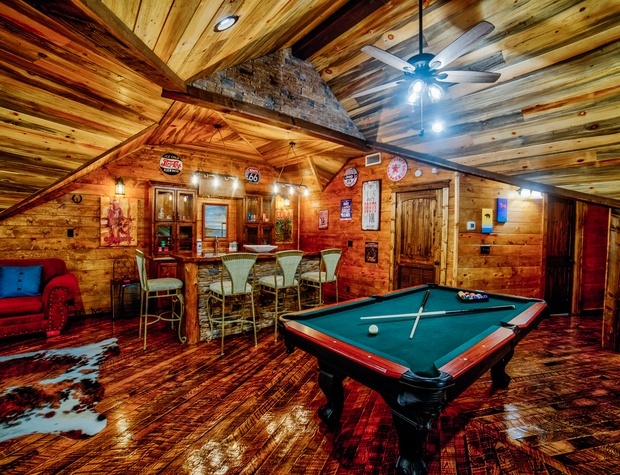 You will be entertained with a pool table, two arcade games and a HDTV with Direct TV package (PPV not available). 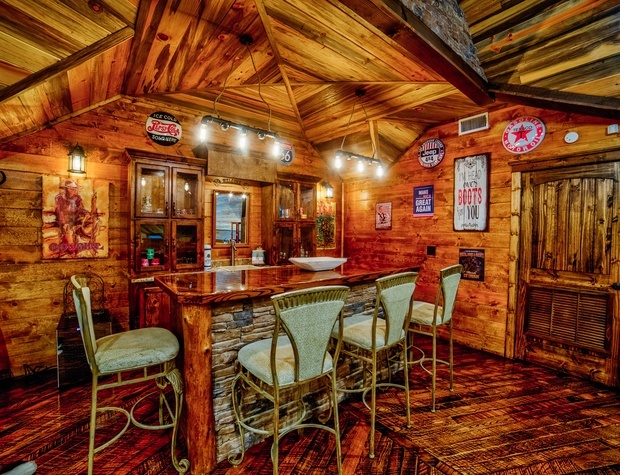 The custom stack rock bar has a beverage chiller and stool seating. 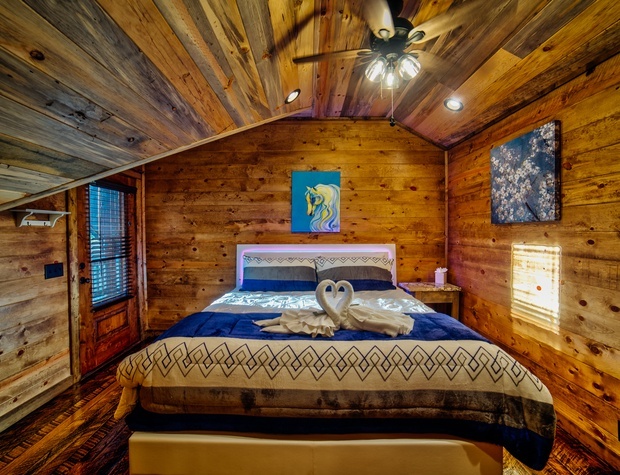 In this area are two queen size beds with trundles and 4 twins, perfect for kiddos! 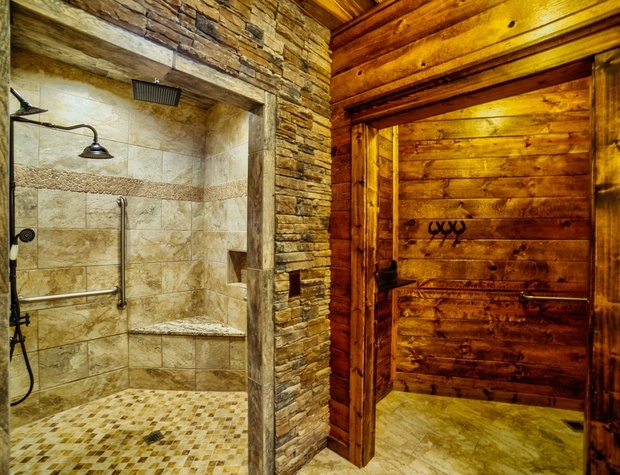 Upstairs you will find three more king master suites with amazing rock showers and each with a balcony area!